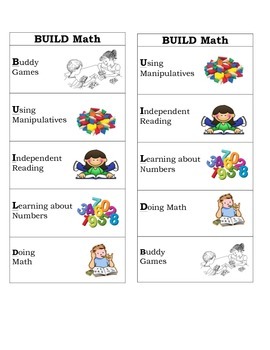 These bookmarks create your guided math groups. 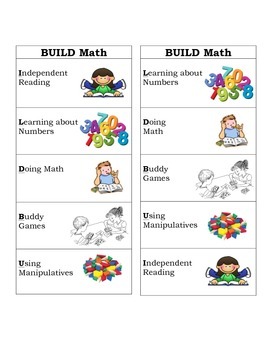 They each have a different order for children to go through their BUILD stations. I copy 4-6 of each bookmark, cut them out, laminate them, and put them in a small bucket for children to choose from. 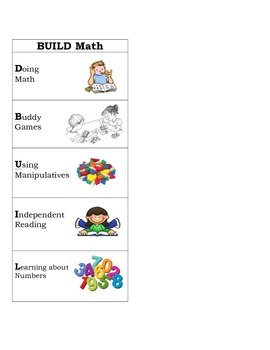 This is the way my students track which component of Daily 5 math they have been to during a week. When it's time for "B.U.I.L.D." math time, they take out their "bookmark" and find which station they're going to today. If we have time, we will go to more than one station in a day. This simply negates the arguments about where to go. It also helps those who can't decide figure out where they're going for the day.